HORSELL’S biggest community event of the year had plenty to keep whole families happy as they basked in the sun on Saturday afternoon. The field at Horsell Junior School was packed with people enjoying the annual village show in weather that was a stark contrast to last year’s wet and cold affair. 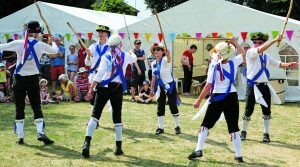 The main focus was on traditional horticultural and crafts competitions but there was a collection of attractions and entertainments to keep people of all ages happy.